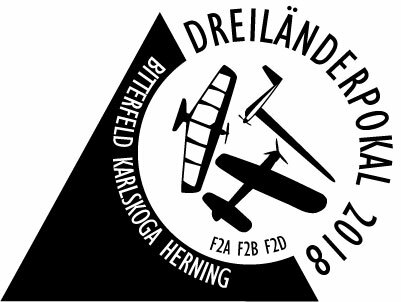 again as a part of the "DreiländerPokal 2018"
Download the Invitation to Dreilaenderpokal and the Invitation to Karlskoga 10-13/5 2018 and the Invitation to Herning 19-20/5 2018 as PDF-file. Camping is possible on site. At the Country-Park-Hotel Brehna, less then 10km away (B100 SO, direction Halle/Salle) we could get a contingent of rooms at special rates. With the code "Fesselflug" you can book single rooms for 45,-EUR, double rooms for 55,-EUR and triple bed rooms for 65,-EUR per room including breakfast. You will find other nice hotels and B&B guesthouses in Bitterfeld, too. In case of problems with the early starting time on saturday at 8o'clock please give a message, we will respect this for the draws. Head of Jury: Dr. Matthias Möbius, Ingemar Larsson, Pavol Barbaric, Rostislav Razboril a.o. Registration deadline: Registration is appreciated before April 15th, 2018. Late registration until opening ceremony possible. Right of participation : A valid insurance is mandatory prerequisition for any participation and must be presented. All participants are liable for arising damages by their insurance. Owner of a valid FAI sporting license and ID (beside of the above mentioned insurance) have the right to take part in the World Cup envents. License will be validated online with FAI database. Make sure your ID is to be found in there. For non-world-cup classes a valid insurance is sufficient. If an attempt to cut off the engine or any other manoeuvre without influence of the opponent results in ruptured lines ( = fly-away), then we will consider the uses material as not suitable and dangerous and we will discualify the pilot from the heat.
" At all World Cup contests, facsimile copies of the judges score sheets from each official flight shall be given to the respective competitor before the competitor’s next flight in the contest or at the latest at the end of each round of the contest." This would require us to provide expensive paper or a copy-machine! We won't do this! The protocols will be available at the office for everyone to copy or photo by himself. Please provide FAI-License/ID for online validation! Please indicate here if you like to take part in one of the national beginner's categories! * Without "Name", "License-Number", "FAI-ID" and "e-mail" no registration ! "If we don't meet in other world, we surely meet in Bitterfeld"